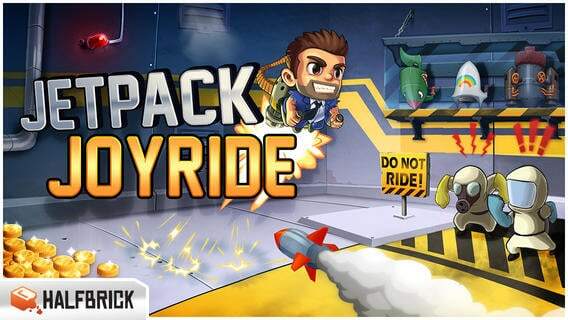 After a quick succession of new games brought out by Halfbrick, Jetpack Joyrider iphone game is the fourth game for iOS to be released shortly. The games by Halfbricks are known for the humorous trailers, like the popular Fruit Ninja trailer in the past. In the game you will have to play taking on the role of Barry Steakfries, who has been given the star status in the earlier games. You are to control this character that is equipped with a Jetpack and make him to navigate in the rough environment of the underground, where he has to avoid numerous dangerous obstacle using his jetpack and your control. The longest distance you can travel will give you a score and put you on the score leader board. There are varieties of obstacles and tools like multiple vehicles, variety of obstacles and it has an endless mode as the obstacles are created randomly. Actually, the game was to be released earlier, but the creators of the game decided to enrich the game with many more features, which will make the game more interesting. Get this Jetpack Joyride Game App for iPhone, iPad and iPod Touch for free from itunes apps store here.